As a prepper, you understand that people need to think for themselves not only in order to survive, but also to thrive. You cannot simply take other people’s opinions as your own – particularly in regards to the financial future of this country. As a citizen, it is your responsibility to measure the best options for your family’s success. While you could purchase gold or other precious metals which will increase in value in an economic breakdown, there are other options which may better suit a survivalist’s needs and ideals. Jason Hartman recommends investing in property to all but ensure your success and well-being in an economic collapse. Purchasing rental property will bring in funds today and allow for leverage in a future collapse. Even large tracts of nothing but forest will prove helpful in a future where paper cash has little value. On your land, consider planting trees and vegetation which you can access for survival purposes in cases of natural disaster. The following plants offer uses beyond the food, shade, and oxygen they provide. · Elderberry: Reduces the symptoms of the flu and helps keep individuals healthy during a flu outbreak. · Aloe: The aloe plant is known for its soothing properties for use on burns, including sun burn. · Mint: Mint can soothe poison ivy, oak, or other itchy rashes. It is effective in treating indigestion, gingivitis, colic, and as a muscle relaxant. · White Oak: The acorns from the oak can be ground into a flour and used to make breads and other foods. · Maple trees: Who doesn’t like fresh maple syrup? · Birch or Willow trees: Both contain salicylic acid, which was used for aches and pains prior to aspirin. Chew the bark to relieve headache or muscle aches. · Cascara buckthorn trees: The bark can be used as a laxative and will help purge the body of poisons. · Sassafras: This aromatic tree’s bark, when boiled, is an excellent diuretic. The bark from the roots are the most effective. 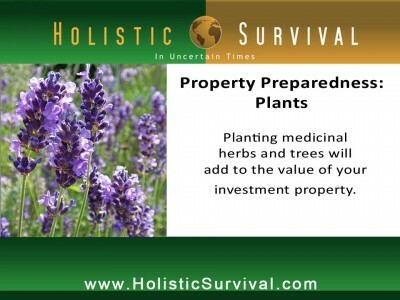 · Lavender: Not only will you always smell nice, the lavender plant offers many healing attributes. The scent can help with insomnia, lavender vinegar can be used to reduce colds and fevers, and lavender tea will relieve anxiety and calm headaches. Additionally, the plant has been known to act as an efficient insecticide.